One of the many salads we devoured last weekend on our tropical mini-break was a holiday favourite – we have eaten this on every summer camping or beachside weekend away for years and years, so whenever we eat this, it always feels like summer to me. It is spectacularly good with flaked smoked trout and a dollop of mayonnaise. I think the original recipe is from a Gourmet Traveller some years ago, but have no more specific source than that except my friend J, who first gave me the recipe. The only other thing I know about this dish is that anyone who tastes it loves it, and it keeps happily for days and days as leftovers. So if you would like to summon up summer this weekend, go ahead and try it out. This quantity works well for six greedy grunters (us) or eight more sedate eaters. Bring orange juice to boil in a small saucepan with butter, salt & pepper. Turn off the heat and stir in couscous till well combined. Leave for at least half an hour. Lightly toast the pine nuts in a non-stick pan. Saute zucchini slices in olive oil until well browned and soft. In a large salad bowl combine all remaining ingredients, and season well. Add the cooled zucchini to the mix. Take the saucepan and gently comb and scrape the couscous until the grains separate – this takes a while and it’s important to be patient, otherwise you end up with big lumps. Empty the loose grains into the salad bowl as you go. Often the last thin layer has to be discarded. 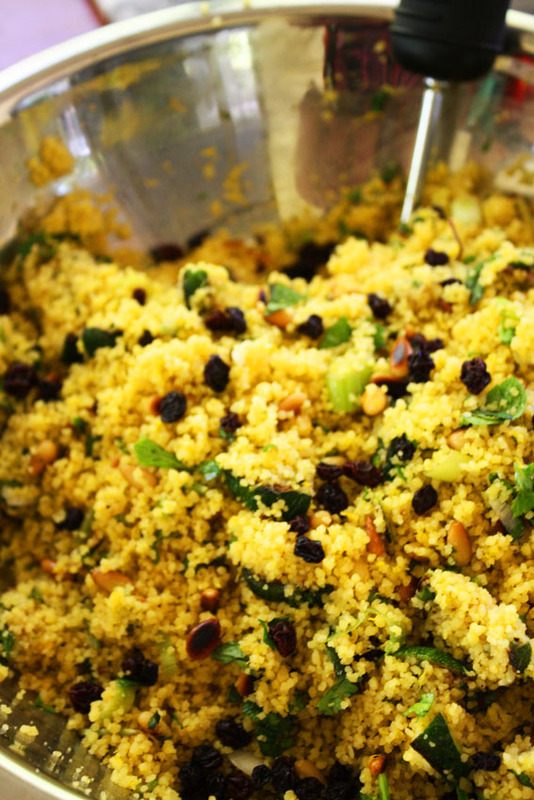 Stir other ingredients loosely through the couscous until well combined and check seasoning. You are currently browsing the archives for the starches miscellaneous category.